Rare Late 17th Century Brussels Historical Tapestry: Alexander and Por – Turco Persian Rug Company Inc. 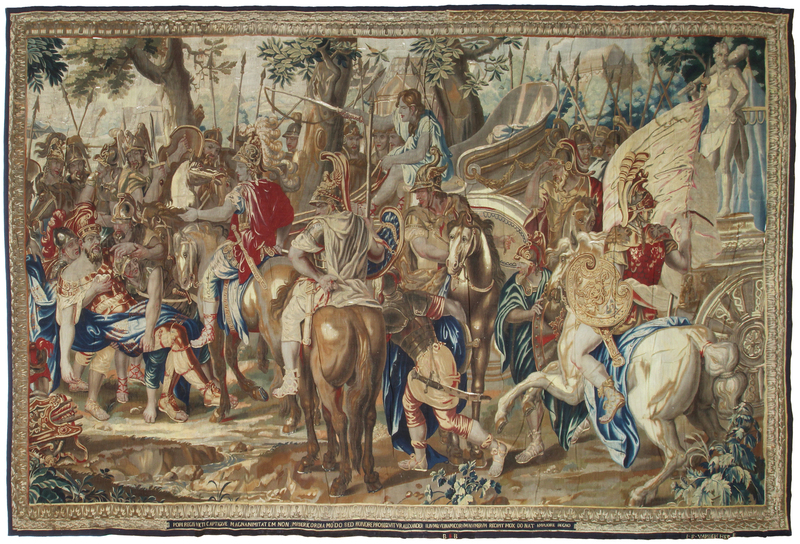 This fine and rare late 17th century Brussels historical tapestry, woven in polychromatic dyed-wool (with silk accents) backed with linen after caricatures by Charles Le Brun (1619-1690) and depicting King Alexander the Great victorious over King Porus of Pandschab at the Battle of Hydaspes in 326 BC. On the left the fallen King Porus is supported by his men as Alexander gazes towards him from astride his horse. The victor is flanked by chariots and warriors with his encampment nestled behind the trees. The bottom of the tapestry (within a navy-blue field) reads:"PORI REGIS VICTI CAPTIQVE - MAGANIMITATEM NON - MISERICORDIA MODO SED - HONORE PROSEQVITVR ALEXANDER - ILLVMIQVE IN AMICORVM NVMERVM - RECIPIT MOX DONAT - AMPLIORE REGNO". Centred below this is the weaver's mark for the town of Brussels in Brabant province and in the lower right it notes:"J F VANDEN HECKE". Jan Frans Van den Hecke was apprenticed under his father Frans, becoming dean of the family tapestry workshop in 1662 and remaining active until c.1700. Tapestry scenes depicting victorious battles, hunts and tournaments were very popular with the aristocracy, becoming symbols of status which kings and nobles would transport with them from castle to castle; they were also taken as spoils of war. CONDITION: Very good; minor splitting and re-weaving. Temporary vertical folds are from storage. Click here for full page image. Actual Size 12' 3" x 19' 2"